This is how I made mine – and why I’m looking forward to chairing the Difficult decisions and how you make them discussion at the Brighton Summit. When I left the BBC, I had a romantic idea of being a ‘portfolio’ worker. Someone who would offer a range of services, based on my broadcasting background. They were all the good traditional options for people leaving journalism – media training, PR, copywriting. 18 months in, my brain almost exploded. I hadn’t realised that start-up businesses are, by their nature, portfolio businesses. You might be called a sole trader, working on your own, but you end up doing multiple jobs. I’ll take you back briefly, to how my life used to be. In the olden days, when I arrived at work, my desk and height-adjustable chair were in the same place. My phone and post-it notes were where I’d left them the previous afternoon. OK, the cleaner might have moved them by a few centimetres, but nothing really changed. My colleagues stayed roughly the same, bar retirement or promotion. The nice people at computer support were just a phone call away. The meeting room was down the corridor. Sometimes it switched floors, but it was no big deal. I didn’t have to think consciously about any of these things. I was being spoon-fed and paid at the end of every month. This carried on for almost a quarter of a century. 24 happy, straightforward years. Then I set up on my own. I’d heard that start-up businesses do everything themselves. But the full implications of what that meant hadn’t sunk in. The steep, start-up learning curve. Overnight I had to shift from just having to think about my work to having to be proactive about everything. Every little thing. Down to the tiniest paperclip. The nice people at computer support were no longer available. Meeting rooms weren’t down the corridor, but scattered across London and the South East, in cafés and other offices. There were no colleagues as such. No one to have tea with or bounce ideas off. At that point, I did feel very ‘sole’. And the only way I was going to get paid monthly, was by constantly networking and following ‘The 7 Points of Contact’ marketing rule. 7 points of contact? You are joking? When I was at BBC Radio 4, its ‘Contact Rule’ meant tapping a colleague on the shoulder and saying, “What do you think of this idea?” If they liked it, I’d pitch it to the Editor. If they didn’t like it, I’d come up with a few more. Either way, I still got paid at the end of the month. Accountant/Bookkeeper (drag me there screaming). And that was in addition to doing my three new day jobs of PR, copywriting and media training. No wonder my brain exploded after a year and a half. Worse. Once I’d grappled with my accounts, I found that I wasn’t being paid properly at the end of every month. Do I carry on, trying to do everything and not achieving anything very well? Or do I go back to being a wage slave? Or do I do a Bridget Jones, and choose vodka and Chaka Khan? 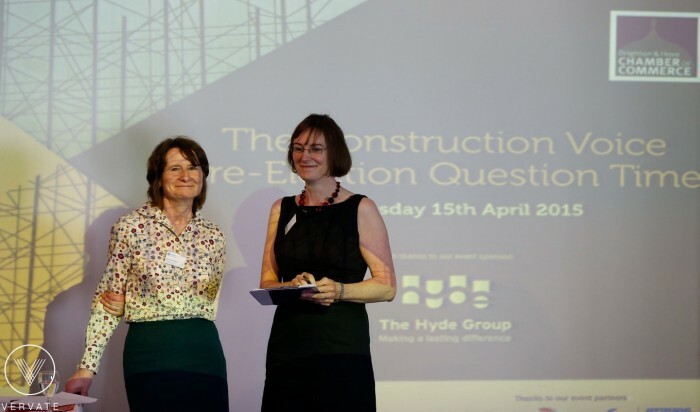 I’d reached an impasse – a familiar one for the Director of Brighton and Hove Chamber Of Commerce, Sarah Springford, and one of the topics at this year’s Brighton Summit – Your desires, dreams and real business. Sarah (pictured above, with a microphone) meets a lot of successful businesses, at different stages of their growth. That includes SMEs who are still trying to find their position in the marketplace and work out who their ideal clients are – just as I was trying to do four years ago. Not all ideas or businesses will be successful, perhaps because it’s not possible to get enough customers for their idea. So I see a lot of people who are going through the process of seeing whether an idea is going to make money or whether they need to change it. Sometimes they might have to change it just slightly. Sometimes they might have to do something quite different. From beginner to real business person. I chose none of the above options (with the exception of a small amount of alcohol). But shift I did. I switched from portfolio working to becoming Very Niche Indeed. With feedback and help from people like Sarah, and the then Chamber President Julia Chanteray, I figured out what I really loved about my work – interviewing people in depth and unearthing the stories that help them to see clearly the value of their work. Crucially, in terms of business, I worked out that this passion of mine (desire / dream) really helped the founders and directors of companies facing change or fast growth. In-depth interviews with them, their clients or their teams, give them real clarity about their position in the marketplace and the value of their company. Even better, these conversations generate lots of ideas for articles, newsletters and case studies. That’s handy, when businesses are increasingly judged on the quality of their website content. So, by becoming a niche business, I could focus on what I cared about and turn that lifelong enthusiasm into what the Chamber would describe as real business. I had to make more quick decisions during this period. I sacked myself from those eight other jobs. There were no 30 day notice niceties. Without a second glance, I said goodbye to portfolio working. After these summary sackings, I had to find replacements. People who would do the office management and maths much better than me. And thanks to the Chamber’s network, I found my invaluable secretarial support, my expert bookkeeper / accountant and a number of other very gifted associates and collaborators. No one can do everything and things also change in business. I think the Chamber is a really good place to get support, building your network of people you can trust and who can help with different things: marketing strategy, business coaching, proactive accountancy… That support is really important and the Chamber is brilliant at that because it’s such a big community. 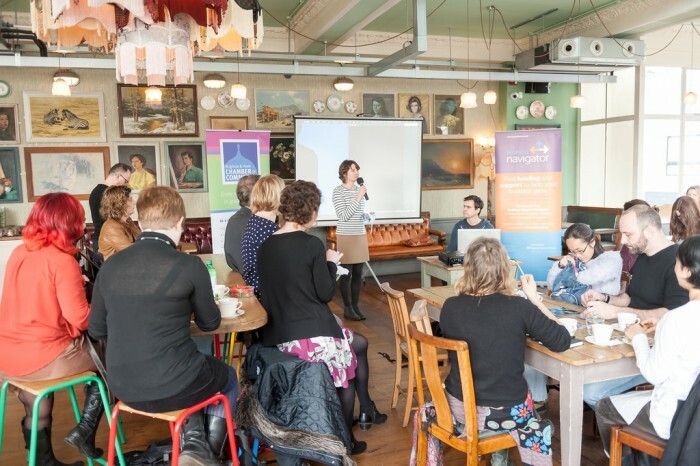 Which brings me onto the Brighton and Hove Chamber Of Commerce and its highlight event of the year, The Brighton Summit (14th October 2016). 200 businesses have booked already. So, if you are hoping to build your network of trusted colleagues, make sure that date is in your diary. You never know, you could bump into someone who will happily take away the stress of the jobs you hate, leaving you to get on with what you do best. Your desires, dreams and real business will also give you inspiration and practical tips on how to identify what really drives you and whether your business dream will bring you the profits that you deserve. Get help with those tough calls. As for my business, that difficult decision to switch from portfolio to niche did pay off. It had its gut-wrenching moments, lying awake at 4 o’clock in the morning, wondering whether I’d done the right thing. But 3 years later, I am clear about what drives me, I know which companies and individuals it helps most and yes, it has led to real business. That was just one of many tough calls I’ve made during my relatively short entrepreneurial life. There’ll be more where they came from – and your list of conundrums might be very different. Whatever they are, I think you’ll find this session at the summit very useful: Difficult decisions and how you make them. I’m biased, because I am facilitating it and I can’t wait to hear what the panel has to say. Come and say hello when you’re there. First image by Vervate www.vervate.com.